I partnered with Pick ‘n Save to bring you this delicious recipe, but as always, all ideas and opinions are my own. 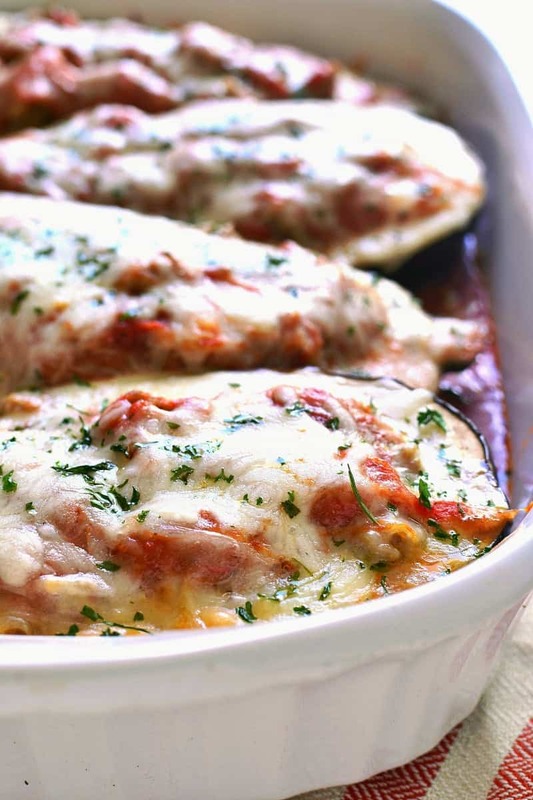 Lasagna Stuffed Eggplant makes the most of fresh summer produce by combining two classics in one delicious dish. 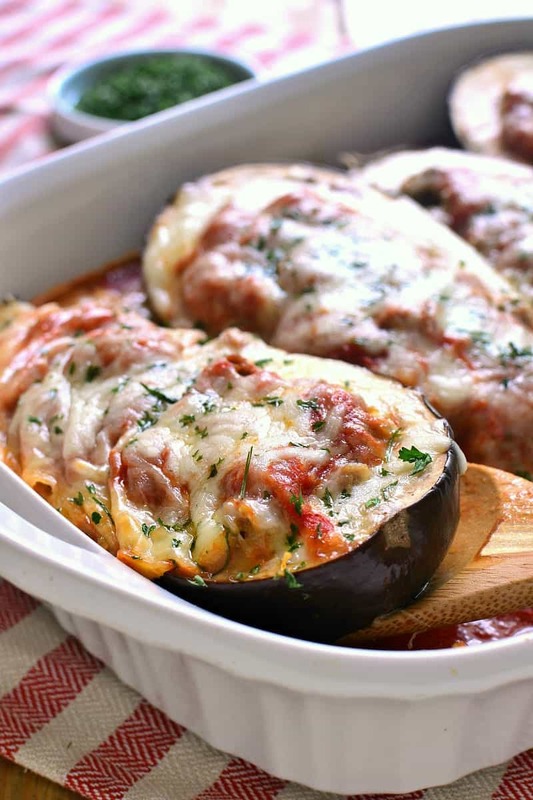 Baked eggplant meets creamy lasagna and the result is pure comfort food that’s perfect for summer! So I’ve decided that one of the worst punishments ever also happens to be something I’m forced to do on a very regular basis: grocery shopping with kids. I’m not sure what it is about kids and carts and food and grocery aisles….but for some reason, it feels like the most perfect storm. Every. Single. Time. I’m pretty sure it has nothing to do with the grocery store and everything to do with my kids….which simultaneously makes it better and worse. Better because at least it’s not my grocery store that’s the problem….but worse because that means it’s my KIDS who are the problem! Which, come to think of it, is actually way worse. And I’m not sure if it’s a good thing or a bad thing that we almost always shop at the same store, our neighborhood Pick ‘n Save, so the people there know us and know exactly what to expect. There are no surprises when the girls are playing hide & seek in the aisles or pulling Oreos off the shelves or begging for samples of salami and cheese. And no one gives a second glance when Myla is yelling because the horn on her car cart is (still) broken or throwing a tantrum on the floor because we can’t cut into the watermelon right then and there or insisting on pushing the cart herself and therefore bumping into shelves and walls and people. No, there are no surprises, although I’m pretty sure the employees all brace themselves when they see us walking through the door. And I wouldn’t be surprised if they talk about us after we leave. We are, after all, quite a scene. And to be honest, I have to brace myself, too. Even though I seem to find myself at the grocery store daily, it’s still something I dread doing with kids. And still something that leaves me feeling a little bit like I deserve a reward. 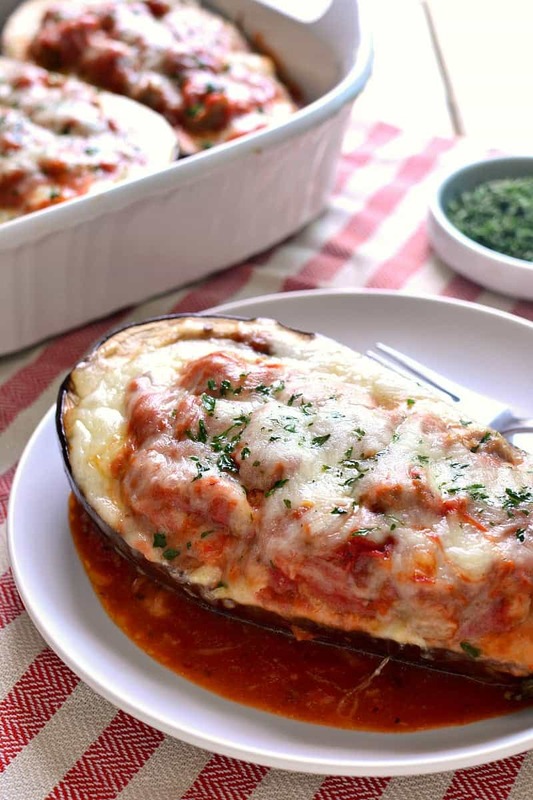 Which is exactly where this Lasagna Stuffed Eggplant comes in. 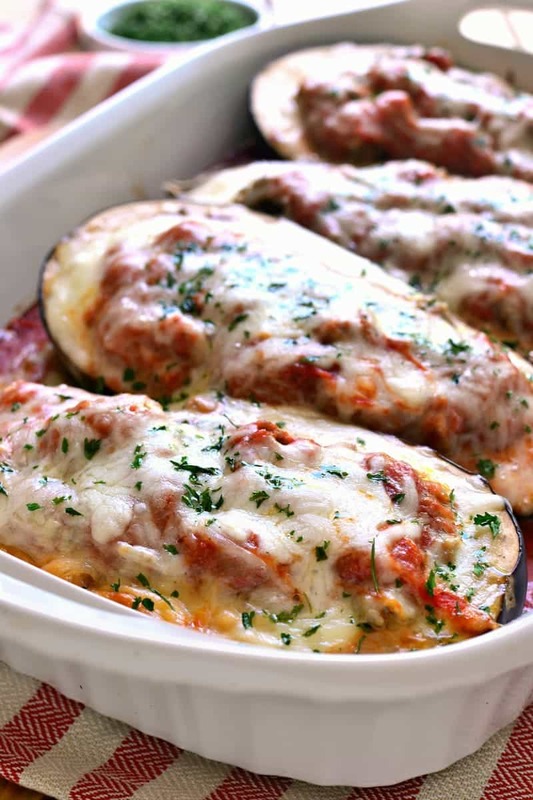 Made with fresh eggplant I found at Pick ‘n Save and stuffed with a creamy lasagna filling, it literally melts in your mouth and leaves you feeling so very much better. It’s summer comfort food at its best, and exactly what I need following an afternoon at the grocery store with kids. Or….an afternoon at home with them. 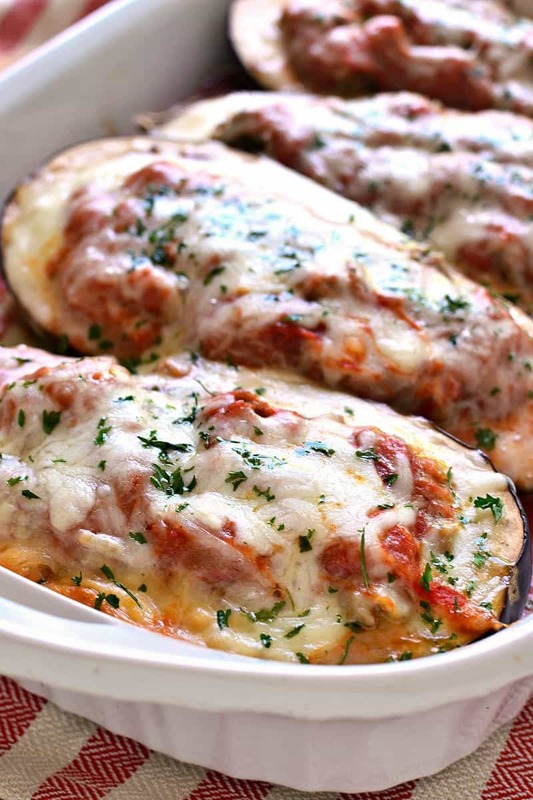 Seriously, just bring on the Lasagna Stuffed Eggplant! 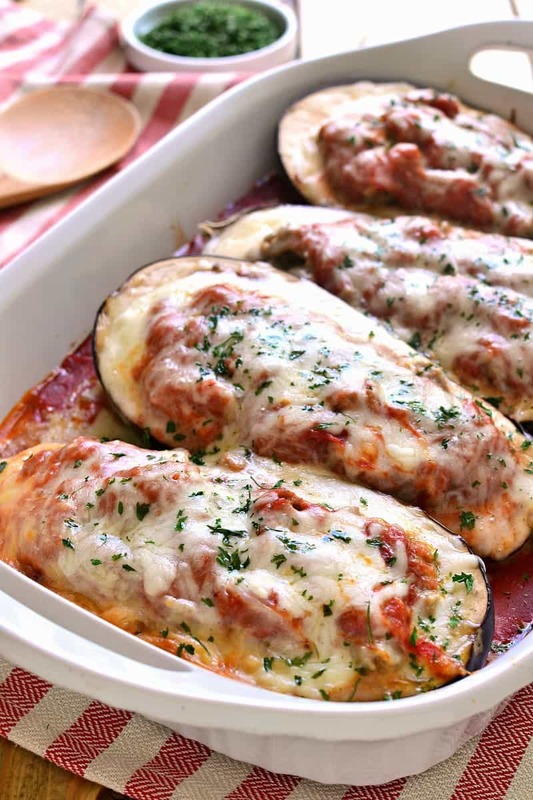 Lasagna Stuffed Eggplant makes the most of fresh summer produce by combining two classics in one delicious dish. Baked eggplant meets creamy lasagna and the result is pure comfort food that's perfect for summer! Remove Italian Sausage from casings; brown over medium-high heat. In a small bowl, combine & mix ricotta cheese, parmesan cheese, eggs, parsley, and garlic powder. Cut eggplants in half lengthwise and scoop out centers, leaving about 1/2 inch of flesh. Prepare a large baking pan by spreading 1 c. marinara sauce to cover the bottom of the pan. Place eggplant halves on top of sauce. 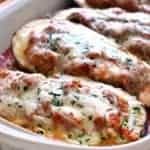 Spoon ricotta mixture evenly into eggplant, then top with cooked sausage, remaining marinara sauce, and shredded mozzarella cheese. 0 Response to "Lasagna Stuffed Eggplant"